Leonardo obtained his MS degree from the Polytechnic of Turin and his Ph. D. degree from the University of Tokyo. He has been at the forefront of a number of initiatives that have helped shape media technology and business as we know them today. Among these MPEG which he founded and chairs and the Digital Media Project of which he is the president. 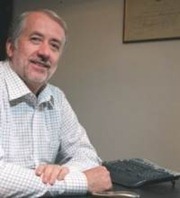 Leonardo is the CEO of CEDEO.net since its establishment, the President of SmartRM, Inc. since its establishment in September 2008 and the President of the dmin.it Consortium since its establishment in May 2010.